The weather is hot, the skies are clear, and everyone in New York is preparing to clear out for the upcoming July 4th long holiday weekend. If you're like me, the first thing you're thinking is, "What am I going to wear for 4th of July?!" I love dressing for an occasion, but 4th of July is tricky for some guys. Never wanting to dress like an American flag, I prefer to go for summer trends that I can tailor to the holiday. For this July 4th, I'm rounding up all my favorite pieces for summer dressing here, taking inspiration from the new summer capsule collection between Tod's and Mr. Porter. I'm obsessed with this collaboration and seriously want most of the pieces - but in case they are a little out of your price point I pulled together some styles to help you stand out for the holiday weekend, and the rest of summer. Check out my top trends and picks for your go-to 4th of July outfit below. Finding the perfect 4th of July shirt is my first priority. I always want to be festive and play with color, but I try to avoid going for the full American flag print look. Instead, try what is arguably this summer's most popular men's trend: the camp collar button down. This style of shirt is relaxed but refined, and adding a fun print is a great way to celebrate summer while staying stylish. I'm favoring these lighter blue shades in honor of the holiday, and also because they don't stray too far from my neutral tones. These shirts will be sure to keep you feeling patriotic, but won't make you look like a walking flag. A good printed short is a summer staple. Prints really came back strong for men this summer season, and I'm loving it! I'm digging graphic stripes, abstract lines, and florals for the summer months. Color is your friend here, and it can really show off the details in the pattern. Take for instance the yellow short above. 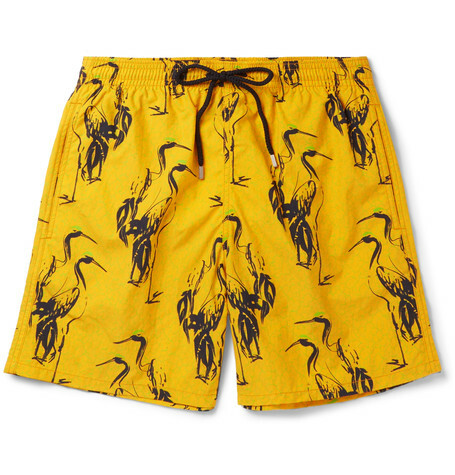 Perfect for the pool, yes, but pair it with a crisp white linen button down and tan suede penny loafers or espadrilles and you can take these out to early evening drinks at the bar. Multi-functional? Check! I'm a huge denim fan, and light wash denim is the perfect style for the summer. 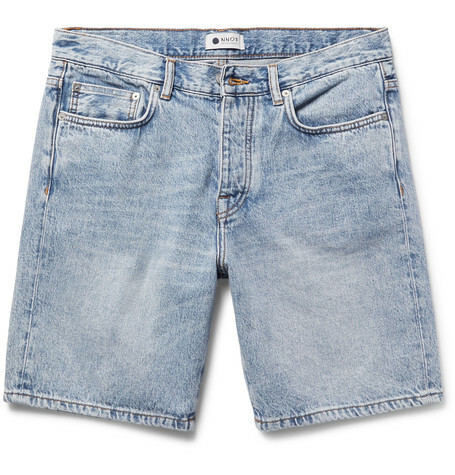 For days when it's a bit hotter, I fully support a denim short. The key here is to keep the length just above knee so you don't look like you're straight out of 1972. Another easy option is a light wash denim chambray shirt. The fabric is cotton so it's super breathable and won't make you melt in the heat like a synthetic would. When wearing denim shorts, try and keep the rest of your look a little more polished - adding a crisp button down and penny loafers or fresh-out-of-the-box white sneakers. The key to dressing for 4th of July, and the rest of summer, is really staying comfortable while playing with lighter fabrics, more vibrant prints, and mixing up your wardrobe. What are your favorite summer pieces? Leave a comment below!